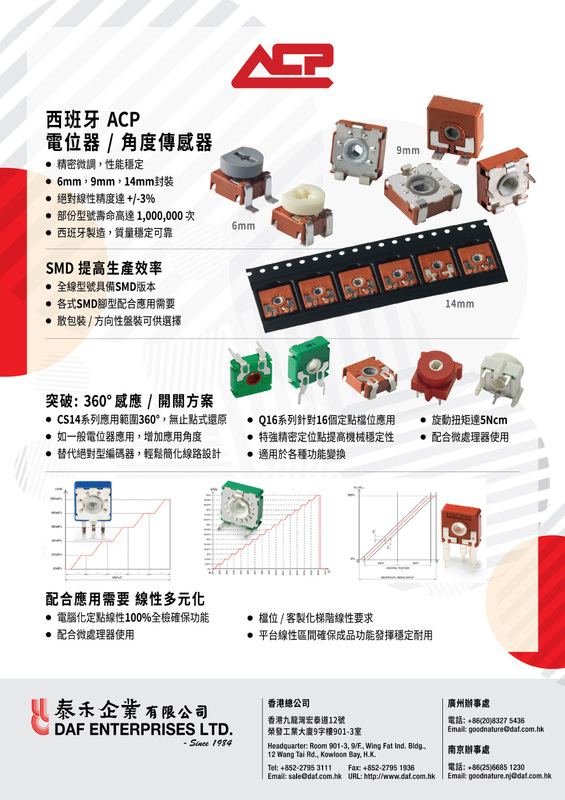 We continue our promotion around the world, this time, our Chinese distributor DAF ENTERPRISES LTD recently published this advert at the renowned magazine, Electronic Technology, promoting ACP SMD line and most recent ACP products (CS14, Q16 and potentiometers with detents). ACP goal has always been to get closer to our customers' needs, for this reason, we develop products according to the market requirements, moving to SMD is a clear market direction, CS14 is a 14mm rotary position sensor with 360º mechanical rotation angle and Q16 is a particular application of the CS14 product family, when robust and precise detents are required. For more details surf our web and please, get in touch with your ACP sales channel for technical support and orders. DAF is an authorized ACP distributor in China and provides service with local stock and through their qualified sales team.